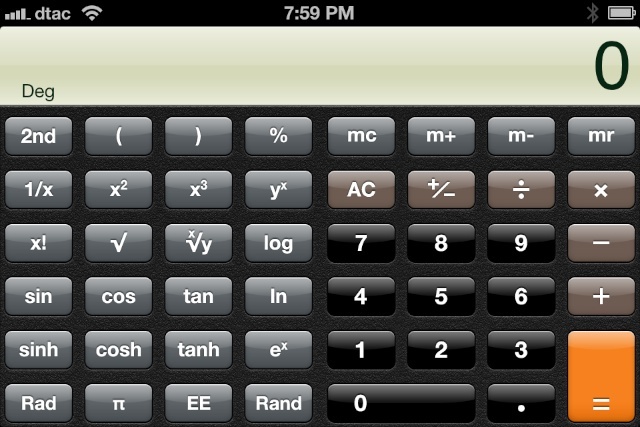 There is a reasonably useful calculator app on the iPhone that has additional functions when used in landscape mode. It operates fairly quickly although the results are not exportable. You enter numbers using the keys, calculate and that is it. 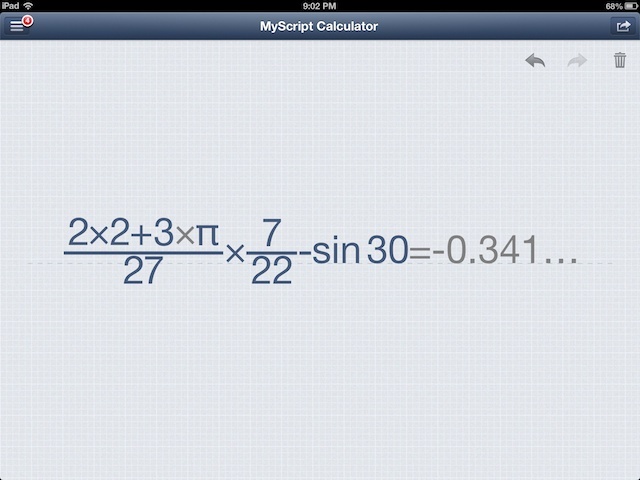 A new calculator app, MyScript Calculator, has some value in that the input is by way of the touch screen. 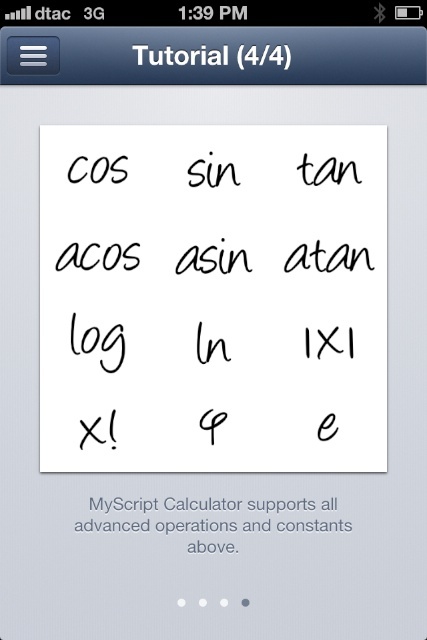 The app changes the hand-written characters to formatted numbers and symbols, then completes any calculation. The display can be altered by adding more numbers or symbols and calculates the new input. Fortunately, when I first downloaded the app, I was sharing the lunch table with colleagues who all have PhD degrees in Electrical Engineering, so my usual quick look was assisted by some useful technical input. One colleague was quite intrigued with the way the calculator worked, noting when I tried to add a Greek symbol to an equation, that the epsilon represented a variable, while his ls and my later entry of Π were accepted, as these are constants. I also later tried with trigonometry functions like tan, cos and sin (all lower case) and these appeared instantly. The way in which a user is able to enter information so easily makes this fairly intiutive in use. Rather than key entry delays that occur with normal calculators (and the iPhone Calculator app), data entry with this all flows as if we were working on paper with a pencil. With finger input, it is possible for a few recognition errors to creep in, but these are easy to fix. Back and forward arrows make it easy to undo or redo any action. A menu accessed by a button at top left gives access to four main items: the Calculator itself; a Tutorial section; Notifications; Settings; and About. Instead of a simple text page, the About section has a series of buttons with links to About Us (Vision Objects and Web Demons), Help & Support, Follow Us (Facebook, Twitter, Blog), and Legal (Credits and License). The Tutorial has a video and three other screens showing characters that may be used. Although not essential, this was a useful confirmation. Once a calculation has been completed, there are a number of methods to export the equation. This may be done using the usual Export arrow top right of the screen. There are four options: Mail, Twitter, Facebook and Copy. 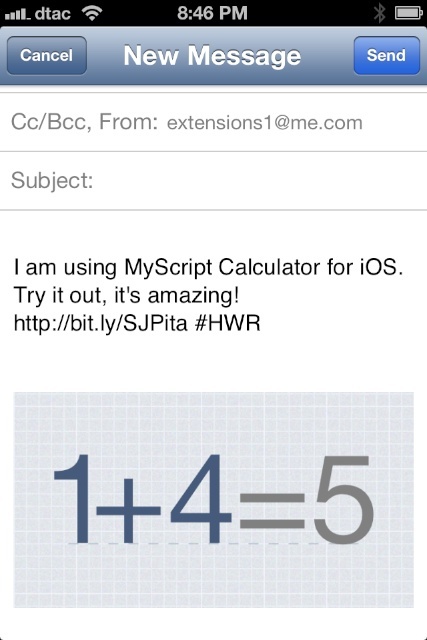 MyScript Calculator is a free app that allows a user who needs to do some occasional calculations on the fly a quick and easy method to enter, calculate and export. Sending the result to email was straightforward, but using the Copy function was a little hit and miss. It worked quite well with an SMS message as well as a Keynote slide, but Paste would not work at all with Notes. I carried out most testing on the iPhone where the smaller screen did cause some minor limitations, although the app was certainly usable. I later tried the app on the iPad and the full-screen display gave me a far better interface on which to work: the size making a considerable difference. 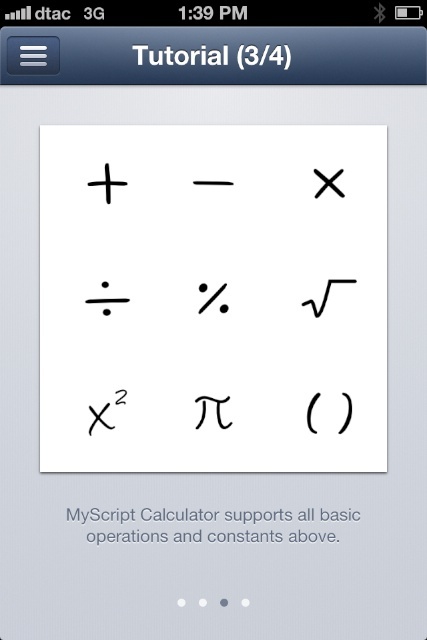 This is not to detract from the iPhone installation where MyScript Calculator was easy to use; it is just that the larger screen was that much nicer to use. With one or two minor problems, this app is a useful addition to my apps collection. 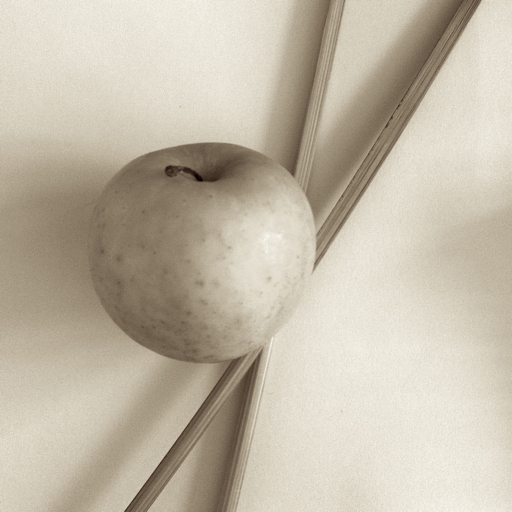 Its ease of use and obviousness in its operations - as well as being free - makes this an easy choice.